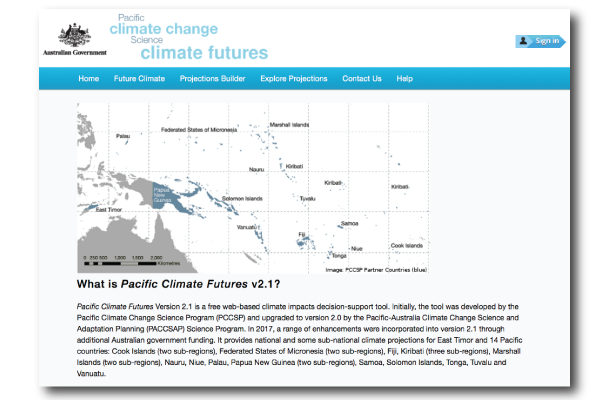 Pacific Climate Futures is a user-friendly, web-based tool, built upon the extensive analysis of global climate models (CMIP5 and CMIP3) from climate change in the Pacific. Users can explore the likelihood of future changes in a range of variables (temperature, rainfall, wind, sunshine, humidity and evaporation) based on 13 time periods (2030, 2035, 2040, …, 2085, 2090) and four greenhouse gas emissions scenarios (very-low-RCP2.6, low-RCP4.5, medium-RCP6.0 and very-high-RCP8.5). Understanding projections of the future climate is essential for underpinning climate change adaptation strategies and contributing to sustainable development. The Pacific Climate Futures Data Portal receives historic data from the Pacific Climate Change Data Portal, allowing Pacific Climate Futures to produce application-ready future datasets. This tool is able to be used by the public for information on climate projections in the Pacific region.